ICO’s first East Africa Permaculture Project is located in Kithoka, Kenya which is a temperate, very fertile rural area made up of small shambas (farms) about 30 minutes north of Meru Town near Mount Kenya. The permaculture farm also called a “food forest” was implemented in October 2018 on 4 acres of land which also houses Kithoka Amani Children’s home (KACH) and Tiriji Eco-Centre. KACH is the home of approximately 60 children. The permaculture project was created for two main purposes. The first was to address the general problem of malnourished students who struggle to learn while hungry or starving. Studies have shown that academic capabilities increase when children are fed nutritious meals throughout the day which is sometimes atypical in East Africa. Food production at the site increases food security, builds self-sufficiency as well as increases the nutritional intake of the children through eating organic food from their small local farm. 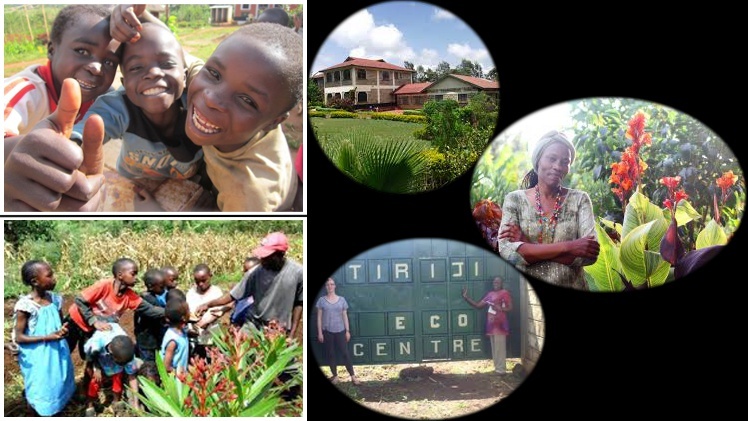 The second goal was to convert Tiriji into a Teaching Centre where people from Kenya and other Eastern African countries come to learn the best practices of permaculture at monthly workshops. Participants return to their communities with new agricultural development skills. The financial benefits of the workshops help KACH become more self-sufficient. Leaders from Tiriji also work to set up permaculture projects with schools and communities across East Africa. Dr. Karambu Ringera founded KACH and Tiriji. She leads on-the-ground activities and the children living at KACH call her ‘mom’. ICO project leaders Mark and Josanne Holland supervise each project, spending 4 – 6 months in Kenya every year. They prepared and worked with this project with world-renowned permaculture expert Michael Nickels of Seven Ravens Institute on Salt Spring Island, BC. Nickels applied thirty years of experience in permaculture, reforestation and his ongoing commitment to Kenya to focus on this project. Nickels set up the project with the man he trained, and now has partnered with for 10 years, Josephat Barasa (JB). Three initiatives at 3 separate sites are being planned inside the East Africa Permaculture Project for 2019 and 2020. The first initiative is to establish a permaculture “food forest” at Kakamega School for Deaf Children. Similar to the KACH program, the objective is to improve the food program for orphaned children. The second is the construction of a demonstration farm and learning centre at Kakyabunga Dream Farm in Lyantonde, Uganda. To implement the projects, Brandon Bauer and Marie-Pierre Bilodeau, two of the three members of last year’s Canadian crew, will join Kenyan colleague Josephat Barasa. The Kakamega School for Deaf Children is located in the town of Kakamega, Kenya not far from the bustling border of Kenya and Uganda. The orphaned children at this school face multiple, staggering challenges that range from the stigma of disability and poverty to malnutrition. Deaf children often lack the ability to communicate with their family and community thus face the additional challenge of abandonment. Kakamega School for Deaf Children provides a safe space to learn sign language and vocational training. This landmark school empowers deaf children to overcome obstacles. The school has yet to have a feeding program of nutritious food grown on their own land tended to by their own students and teachers. The plan is to build a permaculture farm to address the need to sustain the school’s feeding program and provide children with vocational training in regenerative agriculture. The second initiative is situated not too far in the neighbouring country of Uganda. Dream Farm Kakyabunga focuses on sustainable agriculture and agro-enterprise to alleviate poverty among vulnerable rural farmers. Since 2013, DFK has organized farmer groups and delivered hands-on training that emphasizes the empowerment of communities and schools. DFK’s proximity to disadvantaged farmers and their communities makes it an ideal location to develop a permaculture farm and learning centre. Jackson Kanuunu the founder of DFK, is a small-scale cattle farmer with a passion for permaculture. Jackson completed his Permaculture Design Certificate (PDC) and Permaculture Training of Teachers (TOT) at facilities established by Michael Nickels and Josephat Barasa of the Practical Permaculture Institute of Kenya (PPIK). Jackson is a passionate and devoted advocate of permaculture techniques and is a strong leader, supporting disadvantaged communities. The 3rd initiative is to find a small suitable parcel of land in Kenya to create a demonstration Permaculture site that is self-sustaining. The goal and plan is to have the food be sufficient to feed about 12 children at a planned Children’s Home on site. In addition, the excess food would be processed and sold, and additional micro-businesses established so that the entire site is independent of donor funds from the West!! We rely on a multi-phase platform to track and monitor the long-term impact of our programs. This includes regular visits for farm maintenance and trainings or the placement of a team member who remains onsite for a minimum of two months.